Also available in 3 lb and 10-lb size. Click on "3 sizes" link at right to see 10-lb variation if it is not currently visible. Volcano Coffee Company is one of Brazil's most unique producers, being located on the side of an ancient volcano and facing the sun perfectly for an intense sunny day and sudden nightfall as the sun drops over the top of the volcano. This produces a high-energy bean that develops fullest flavor in the evening hours. This micro-climate has produced several high-scoring lots in recent years at international cupping competitions. The care taken in processing these beans is world class and exemplary for the industry. 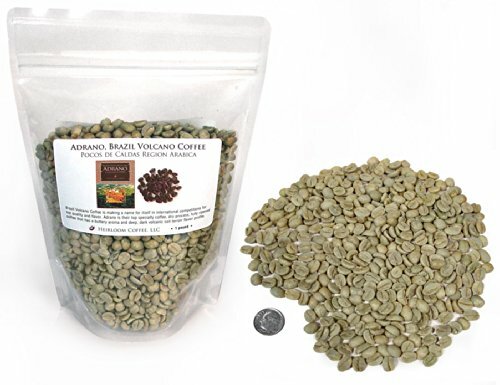 These are some of the highest-quality dry process beans we have seen. The Adrano has several ideal roasting times but excels in dark roasts where it produces a compelling buttery aroma and smooth body while boasting a strong attack on the senses that can only come from a high-sugar, large, hard bean that has been fully ripened in processing. Producer has devoted substantial acreage to certification as a Rainforest Preserve.